Video installation. Kinetic devices built by Woody Vasulka. Optical tools designed by Joseph Krames, Joe Forth and Bruce Hamilton. Exhibition: Biennale d'art contemporain de Lyon, France, 1995. Video installation. Device built by Woody Vasulka. The Machine Vision (1975-) corpus was born out of research into perception begun by Steina in 1975 and pursued ever since. In the videotapes and installations of this corpus, Steina dissociates point of view from an organic perspective and from human intentionality. To do so, she allows a series of kinetic devices supported by optical tools to control the camera. With help from closed-circuit video, these elements render the normal process of understanding the visible world more complex. Originally, this project began with a videotape (From Cheektowaga to Tonawanda, 1975) shot in a moving car, the vehicle representing the machine element behind the point of view. Later, Steina experimented with kinetic tools and machines collected by the Vasulkas since their arrival in New York in the mid-1960s. She first tried placing the camera on a turntable. Finally, two parallel cameras and a mirror sphere were added to the turntable to form the different versions of the work Allvision (1975-). Allvision is the pivotal piece in the Machine Vision corpus. Two video cameras are placed at the ends of a crossbar set on a motorized turntable. Allvision I includes two hemispheres that the cameras point toward. In the second version (Allvision II, 1978), the cameras sweep over the surface of a mirror sphere in the bar's central axis. The video signal is diverted toward two or more monitors far from the turntable. Because the cameras move around a 360-degree perimeter, spectators on the periphery appear constantly on the monitors. One of the cameras captures their image no matter where they are in the room. In one version of Allvision II, four monitors are placed under the turntable. As a result, spectators have an overall view of every component in the work. Though Allvision has been featured in several gallery exhibitions, Steina tries to vary the settings showcasing the work. At times, Allvision is set up in visually complex environments, such as a decorated room, an urban landscape or the Vasulkas' workshop. When the installation is presented in galleries or museums, Steina adds mosaics created by Woody especially for this purpose. 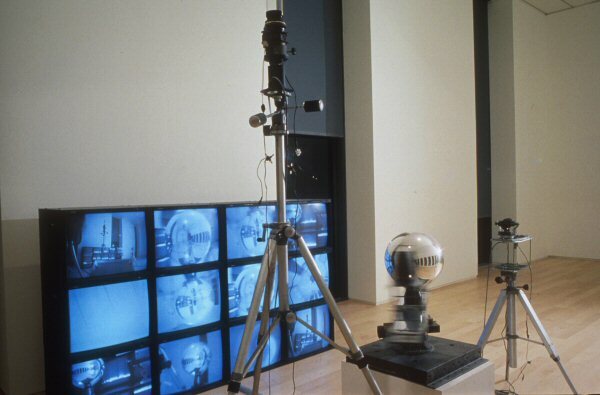 Although installations made up a large part of this corpus, in many tapes made between 1975 and 1977 (compiled in Orbital Obsessions, 1977), Steina used cameras controlled by motorized devices, and she built up a veritable lexicon of the formal vocabulary of closed-circuit video. Urban Episodes (1980) featured small devices equipped with motorized elements, mirrors and lenses. In Summer Salt (1982), Steina physically manipulated a sort of optical prosthesis attached to the camera's lens. In other videotapes and installations completed since the 1980s, The West (1983), Ptolemy (1990) and Borealis (1993), the Vasulkas used motorized and optical devices, but these works do not strictly belong to the Machine Vision corpus. In Allvision, two cameras "face" each other, adjusted in a stable position in relation to each other on a horizontally turning axis. Summer Salt is an exercise in an immersive space. For these six urban capsules filmed in Minneapolis, Steina attached different lenses and mirrors to the camera.